The DJIA traded in a range of 23,300 to 24,014 last week before closing on Friday at 23,996 a gain of around 520 points. The 10 year treasury traded in a range of 2.63% to 2.75% before closing the week at 2.70%. Last week we had a number of interesting economic reports that might give us some strong clues on the future. We had the ISM Manufacturing Index on Monday which came in below forecast and below November by a fair amount. The JOLTS report (Job Openings and Labor Turnover report) on Tuesday came in with 6.9 million job openings versus 7.1 million on the previous report. Consumer Credit for November was reported on Tuesday at growth of $22 billion versus $25 billion in October. On Wednesday we had the release of the FOMC minutes from December being released. While the release was fairly consistent with everything we had heard through various Fed governors who spout off on a regular basis there is plenty of lobbying going on for a ‘pause’ in rate increases (our forecast is for the next increase in June–if even then). Friday we had the Consumer Price Index (CPI) come in at a minus .1%–the core rate which strips out food and energy rose .2%. Also while the government hasn’t released new home sales because of the government shutdown others have released data showing new home sales down 19% in December–assuming this is near correct it is likely that the wild stock market drops during the month contributed to some level of the drop. With a bit of a lag you can always count on stock prices drops which go on days after day and week after week to affect economic data–it takes a month or two to show up, but the wealth effect individuals felt going up totally reverses to ‘the world is ending’–there will be economic consequences. For this coming week we have the PPI (Producer Prices) on Tuesday and it is forecast to show falling prices at the producer level. We also have the Empire State Index on Tuesday so we will see how manufacturing is holding up in New York. On Wednesday we have Retail Sales for December being released. Additionally we will see the Home Builders Index being released and we will see how builders are feeling–we could see more weakness here. Thursday brings Housing Starts being released along with Building Permits. We are going to also see the Philly Fed Index on Thursday. Friday brings Industrial Production and Capacity Utilization. Friday also brings us the very important Consumer Sentiment Index. The consumer drives the economy and we are looking for weakness here–with the wild market actions in December and the government shutdown late in the month we are bound to see softness in sentiment. All in all we are watching to see what kind of weakness we see in the macro economy. Seems reasonable to believe we are going to see weakness–not strength as there simply is too much political turmoil occurring and we think if the politicians are unable to come to an agreement of sorts this week we are likely to see a sizable selloff in equity markets. We saw that the Fed Balance Sheet fell by just $2 billion last week which is the smallest runoff we have seen in a month. We had 1 new issue announced by Medallion Financial last week, but just like the 2 previously announced new issues they have not priced the issue. We previously had new issues announced by Priority Income Fund and OFS Credit–neither has ever priced–guess they can’t round up enough buyers at the right price to get these issues off the ground. The average $25/share preferred last week gained 25 cents last week giving us a 2 week gain of $1.12–pretty darned massive. We have 265 issues still trading at $25/share or less with is about a dozen less than the week before. I reviewed previous comments from the weekend and notice content regarding ENB and four exchange accessible securities. I only have access to two and can not pull info on the others and maybe other securities from ENB. Right now I am trying to exit two Canadian positions that are broker placed orders only at TDAM (which is a big game) and have interest in direct exchange access to any securities…I can scrutinize more fully. Does anyone have a good source for this? I have used BNNCanada for basic quotes in CND Dollar and can also see ENB is LOADED down with a myriad of stacked issues. Any Help? I get the feeling that the balance sheet is a nightmare to analyze for someone of my limited talents and have stuck to ENBA as a deferral to senior position above the preferreds. Joel, are you asking specifically anything about Enbridge or just asking for info on brokerages allowing foreign market transactions? Both. Others analysis may be useful and if I have a broker at TD place an open order to buy or sell at least I can see it and cancel it.I can not alter the price without another call. I DO like the convenience of the consolidated view (all accounts as combined!) as I manage seven accounts in a ‘monolithic’ manner; these are basically our personal accounts. For one or two positions I do not really want a second brokerage. I suppose I am really digging for info on ENB. PS Does ENB collect the 15% Cnd tax? TD always defers these questions to me emailing the company for their policy. Joel, I am pretty demoralized as I wrote a long answer and it never made it…Anyhow…Yes the preferreds are subject to 15% withholding. Per US/CA treaty this is not withheld from retirement accounts. I have read some brokerages screw that up, so one needs to make sure they dont withhold from there. One can file form 1116 to reclaim the withholding. If one has $300 or less withheld (what is amount withheld, not total amount of dividends) they can bypass form 1116 and get the credit without paperwork. I am staying under $30k in these peferreds to stay under the filing requirements. Keep in mind if you are in 0% tax bracket or under 15% you wont get full offset from withholding. You reclaim the witholding to offset other taxes of dividends. This is no problem for me. You should sign up for Moodys (its free) and get clear concise info on Enbridge and their credit profile. They have recent postings you can access and you can find they are currently in process of reviewing for a multi notch credit profile upgrade. If you want more info on their OTC preferreds let me know and I will follow up. I do not blame you for wanting more brokerage accounts. I have 3 and want to get to one….With a physical office….. I just seen how helpful it was when I needed to help handle my fathers affairs at brokerage. I have skills on TD’s site which I have found to be robust as I need. I do NOT know about Tier 2 which I see talked about here. thinkorswim is part of their platform and I will ask the branch manager next time I am in there in Feb. about details. Since discovering that you are in the StL area we can get together if you want to see how I have diligently organized seven accounts on their site and built out a pretty robust data base focused on BBs, Prefs and QDI. I had worked for Scottrade here in StL (they moved me to Colo 12 years ago) and walked hundreds of people thru their site and now TD has accelerated that into a MUCH better ability. Yes, Joel we should do that some time! BTW, TD was the one I was thinking about consolidating too since my HSA is already with them. My dad was a Scottrade account holder and of course you know they are TD now. I like the fact they have local offices. BTW…I use Level 2 with TD through Trade Architect. I couldnt find it on Sink or Swim…I just sink, no swimming when I look at it. Very appropriate name for this “tool”. Level 2 is more of an amusement than any real benefit. You have to wonder about brokerage practices. Vanguard makes me place a call to initiate a buy order on quite a few issues but once it’s in the system I can go in and manually adjust the quantity or the price. And, in most cases, enter a second order. All this in order to warn me that an investment grade issue is “risky” because it’s new. Or because it floats. Yeah, I was really nervous about buying CoBank. Bob, was you able to buy CoBank through Vanguard then? Gridbird, I spent some time on the phone with Schwab today and in the end was not able to place an order CBKPP. They said it is not in their master inventory. The best they could do was do give me the phone number of CoBank’s investor relations department. Alan, that is so odd isnt it? This is usually what happens, fingers point in other directions and nothing gets resolved. Maybe it isnt in master inventory because their techies didnt program it in or management made decision at issuance to dissallow purchase being it is a 144a issue ..The techies at TradeKing are always screwing up my account. I had to call them just last week to get my NISOP purchase currently programmed to NI.B…They had it programmed to NI.PRB which in turn made it untradeable and showing a zero balance in the preferred despite it showing a 1000 shares being held. They are always screwing things up. I have to tell the broker what to do to get it corrected as they usually are at loss and dont understand the problem. I suspect you are at a dead end unless you climb higher up in management. Somebody was buying it today after we discussed it over the weekend. Over 2000 shares traded and bid went to $103 with no one selling as ask went to $104 from $101.25 when I bought at market close Friday. Tried to buy CBKPP for my Schwab IRA and they told me it was on their restricted list. No explanation why. I’ve asked again and we’ll see if they have an answer. CBKPP is the better issue, but alas. Earlier in December, I said I believed we were headed for a recession. I used the wrong term, to me a bear market is a recession. That is technically incorrect. So what I meant to say is we are headed for a bear market. We will soon see if I am right. This is the same type of movement we had in the last 2 bear markets. Check the Twitter graph. On Saturday, CNBC published an article, Goldman’s base case for 2019 is 6% earnings growth. They are now talking about, it could go down to 3%. 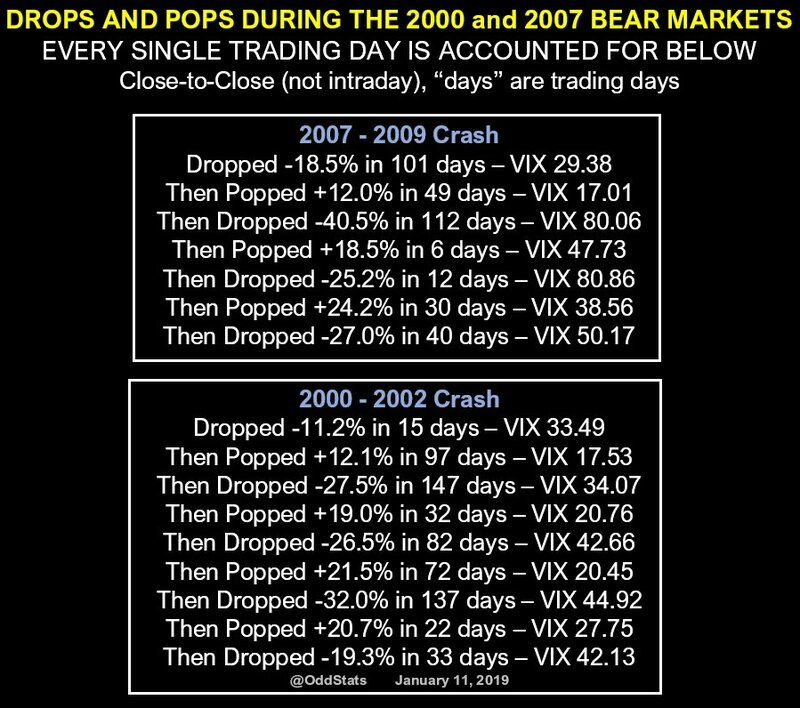 The old adage, ‘buy when the VIX is high’ still very much applies.